In recent days, the currents in Putin’s Russia have noticeably shifted. Triumphant exclamations “Trump nash” (“Trump is ours”) have been replaced by weary criticism and veiled threats. Russia’s state television programs serve as a good barometer of the Kremlin’s moods, as most participants receive a “metodichka” (printed manual, as to the main themes to be discussed). Opinions pushed by the hosts and participating government officials deserve special attention. Recently, Russian politician Sergey Stankevich sharply criticized Trump, stating that the U.S. does not have a viable President and therefore, Russia doesn’t have a reliable partner in Washington, DC or anyone with whom Russia could negotiate. Stankevich described the American President as an elderly, barely competent, nervously weary, fussy man, who is more fit for show business or real estate transactions – not politics. The host of Russia’s ’60 Minutes’, Evgeny Popov, caustically asked: “So why did we [Russia] elect such a President [Trump]?” This comment could be taken as braggadocio, sarcasm or trolling. Notably, the audience enthusiastically clapped, but didn’t laugh. "So why did we elect such a President? Russia’s election interference is a topic that is being discussed on state television with a great measure of defiance and irreverence. On the same show, one of the panelists asserted that “Russia influenced, is influencing and will continue to influence the outcome of elections in Germany.” The host happily added: “And all over the world.” Some participants argued this influence was based on Russia’s “persuasive foreign policy,” while others conceded that Russian hackers and planting or spreading derogatory information about Western politicians played a part. #Russia's state TV: "Trump is a political infant, who is being severely swaddled." Even after Trump signed the new sanctions, Russian politicians and propagandists remained hopeful he would somehow sabotage their implementation. Russia was supportive and protective over the freshly-elected Trump, believing that he would remove the sanctions and act in furtherance of his self-proclaimed pro-Russian stance. #Russia's state TV is overjoyed about #Trump's commentary, counting days to his inauguration. One of Russia’s top propagandists, Dmitry Kiselyov of ‘Vesti Nedeli’, repeatedly worried whether Trump might get assassinated for his anti-establishment views. Illusions were gradually shattered, as Trump wasn’t coming through and sanctions remained in place. The Russians started wondering, whether they made a huge mistake by celebrating Trump’s election with cheers and champagne. —"Let's hit Trump with our Kompromat!" Host: "Do we have it?" 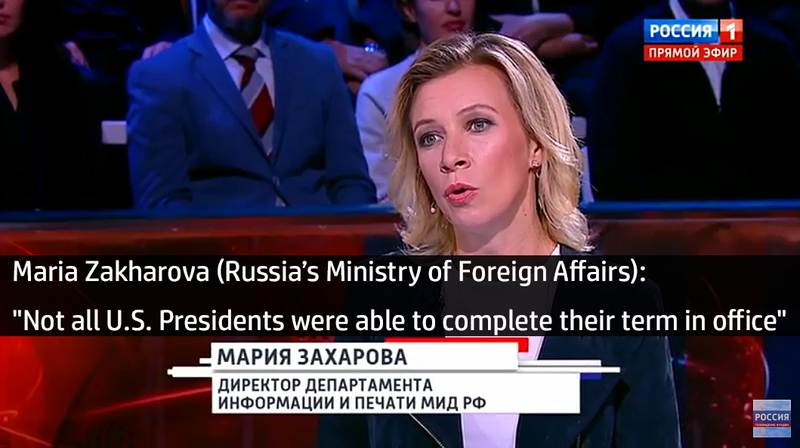 The biggest shift took place after Russia was ordered to vacate the San Francisco Consulate and two annexes in the U.S. Maria Zakharova is the Director of the Information and Press Department of the Ministry of Foreign Affairs of the Russian Federation. She undoubtedly speaks for the government of the Russian Federation. Zakharova’s recent commentary was shocking, to say the least. Soloviev looked noticeably stunned, describing Zakharova’s comments as a “sensational” prediction of Trump’s impeachment. He said, “All American newspapers will come out with headlines “Maria Zakharova predicted the impeachment of the President of the United States” – I brought you into this world and I will take you out.” (Yet another not-so-subtle reference to Russia’s involvement in American elections). A JFK reference, which would be especially ominous in light of Russia’s previous concerns as to whether Trump was in danger of an assassination. Whichever way one might interpret Zakharova’s statements, one thing is clear: the Russian government is no longer enamored with Trump and the official Kremlin is making it known. The ramifications of the intensifying chill remain to be seen in the coming days.